Hundreds of Iranians held a protest after Friday prayers today condemning the death of terrorist Imad Mughniyeh. 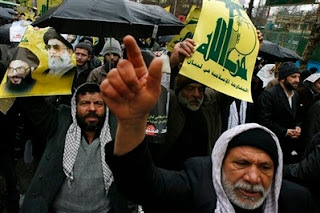 Hundreds of Tehrani Friday prayers worshipers on Friday staged demonstrations to condemn the Zionist Regime’s recent crime of assassinating Hizbollah senior commander Imad Mughniyah. 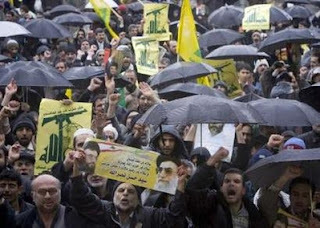 The worshipers, among whom there were political, religious, state and military officials, ventured rainy wheather and took part in the demonstration to condemn the savage act of the Quds occupying Regime. Chanting anti-Israel and anti-US slogans on their way to Palestine Square from Tehran University, the marchers called on the international communities, including the UN, to break silence against such merciless acts. Iranian Foreign Minister Manouchehr Mottaki said in Damascus on Friday that the “martyrdom” of Hezbollah bigwig Imad Mughniyah would breathe life back into the terrorist’s campaign. HotAir has video of Mughniyeh’s burning auto. UPDATE: YNET News claims that Mughniyeh was planning a major terrorist attack at the time of his death. UPDATE 2: Caroline Glick at The Jerusalem Post has Mughniyeh’s true legacy. UPDATE 3: A Marine mother waited 24 years for this funeral.